The Sunny Health and Fitness Rowing Machine (SF-1205) is definitely one of the most inexpensive rowing machine out there that can still give you some level of cardiovascular workout and rowing experience. It is a cheap rowing machine yet loved by many because of its affordability and ability to provide workouts that could make you lose tons of calories. It is one of the best rowing machines that have made it to our recommendable rowing machine list. Just like any good rowing machine the Sunny Health and Fitness Rowing Machine (SF-RW1205) can conveniently help you to work all the muscle groups in the body. It does have the stability and sturdiness to withstand intense workout even as it is simply made. This is definitely the machine for individuals who wish to add an indoor rowing machine to their home gym but are on a low budget. 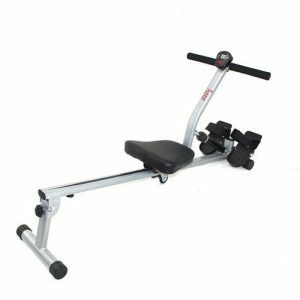 Sunny Health and Fitness manufacturer has long decided to consider the ‘’little man’’ in terms of cash by providing a machine such as the SF-RW1205 without compromising so much in terms of quality and features so that they too can own a rowing. 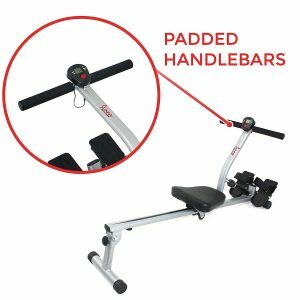 This is also a very popular rowing machine that is loved most by its users with over 600 Amazon customer reviews and an approval rating of 4.2 out of 5. This is a very good indication that you have headed in the right direction by looking up the Sunny Health and Fitness Rowing Machine (SF-RW1205). That being said, this machine does not have commercial quality and construction just as the case with Concept2 Model D or Model E. Although, it will be ridiculous to compare it to these other rowers because they are high-end machines and thus possess an outstanding quality and features that cannot even be rivaled by most rowing machine of the same price range. With less than $100 you will be able to get a rowing machine that will nudge you into shape. The frame of this machine is made of steel and all the parts that are made of steel are coated with anti-corrosive paint that will prevent rust. It is sturdy and can support up to 220 pounds maximum user weight capacity. It has 2 stabilizers with 4 legs, one at the rear end and the other at the front end underneath the footrests. On the frame is the seat that is on the rail and the pulling bar. The rear base is connected and joined to the main frame with a knob to secure and lock it in place. Through this connection point, you can easily fold up the rear stabilizer so that it will be a lot easier to store away. Your best storage position should be to prop it up against the wall or inside a closet if you do want to save space. It is not possible to store it under the bed because it does not fold up entirely flat-you will still have the pulling bar standing out which will prevent it from fitting under the bed. It is a very light and compact machine that weighs just about 23 pounds, therefore, can easily be moved to a storage location. The space it would require when fully assembled is just 53.2’’ L x 20’’ W which is not much. If you observe you will notice that the frame which has the rail and the seat on it is slanted toward the front unlike most rowing machines with rather a flat frame with seat rail. One might actually think that this form will not provide the real rowing machine experience but surprised no user complained of that in their feedback on Amazon rather they saw that as an advantage. Instead, they see the slant as a form that provides the gravity that keeps the feet intact on the footrest even without the straps. The seat is well padded and contoured however some of the users wish it was cushioned a little bit more than what it has, but then reconsider given the price the machine is sold at. While some users think that the seat is a little wobbly but will be fine as long as the specified maximum weight capacity is not exceeded. The seat is fairly good with a size of 12’’ L X 11’’ W x 2” Thick and duly padded but you can always use an extra cushion or a seat cover to improve the comfort if it does not provide the needed comfort required. The rollers are also fairly good as there are no complaints about it in the feedbacks…no, except one person that says his own rollers were getting sticky and that he believes that they are an inferior type of rollers that were used. 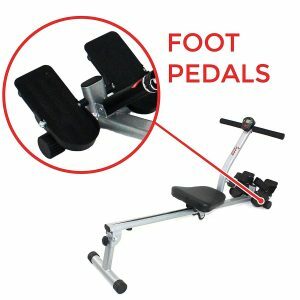 The machine can accommodate users up to 6 feet plus size conveniently, to be precise 6 feet 3’’’ and they should not have an issue with inability to fully extend legs during workouts and the footrests are made to pivot which can also give you the opportunity to adjust their angle to your preferred and suitable position. The footrests come with adjustable straps and are made of PVC materials. The console is pretty basic and so are the metrics that it displays. 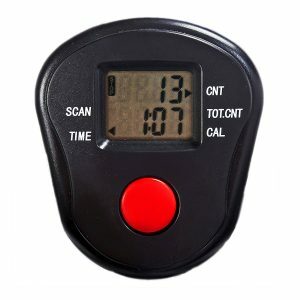 The digital monitor displays workout data such as the time, count, total count, calories burned, and SCAN. This, of course, will help you to track your workout progress and ultimately keep you motivated toward achieving your fitness goals. It has only one button with which you can select any of the values to show or display steady or you can select the SCAN mode to have the monitor automatically display all the values by showing them one at a time for few seconds and rotationally. To reset the monitor, just hold the button down for few seconds to reset. It turns off automatically after like 4 minutes of idle of the machine and can turn on when activity resumes or by pushing the only button. It is powered by 2 AA batteries which are included upon purchasing the machine. The Sunny Health and Fitness Rowing Machine (SF-RW1205) has hydraulic resistance system that only has one cylinder. The resistance is said to be quiet and reasonably effective and efficient. That being said, this can only be effective to beginners, elderly and average fitness level individuals because a particular user has complained of using the highest resistance level which is 12 and rowed for 20 minutes and did not even break a sweat! Obviously, the person must have either gotten a machine with a defective resistance or he is not an average athlete. It has 12 levels of resistance available and you can play around with the levels to know which one suits you the best before trying to go for more challenging levels. And the resistance levels can be adjusted by turning the tension knob and can also be adjusted while on the go with a workout which is of great benefit. Definitely, the resistance may not be perfect but it is effective and most users share the same opinion. The resistance is so smooth and quiet that you don’t have a problem watching your favorite TV or listening to a good music while working out. Neither should you be concerned about disturbing the family or neighbors around or underneath you with noise. The handles are fully cushioned and well padded to convey the much-needed comfort during a workout and to also prevent blisters. With the way the handles are designed, you can work out all the way to your peak performance without knowing it. These also allow for a wider range of motion that ignites the intensity in your upper body workout. This rowing machine is extremely a lightweight machine that weighs just about 23 pounds and very compact as well. The back stabilizer can be folded up thereby making it possible to store it by leaning it against the wall or better still inside the closet. Under the bed would have been a perfect place to store it as well but due to the handle and the hydraulic pump that won’t be possible except if you are willing to get a little bit dirty with work by disassembling the handle and the pump in order to make it fit under the bed. As aforementioned, this machine has over 600 Amazon customer reviews with most of the feedbacks being positive with an average of 4.2 out of 5 approval rating. This goes to show how most users love and feel they have gotten the value for their money if not even more. Admissibly, users noted that the Sunny Health and Fitness Rowing Machine (SF-RW1205) may not be as good and grand as the more expensive rowing machines but it is good for the price and sure adds value to the health of the body. The resistance will tend to drop when it hits up. This is a usual problem that is associated with most of the hydraulic resistance system. The seat is not wonderfully comfortable but can improve comfort by using a seat cover. 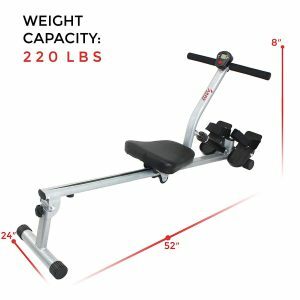 The shipping cost of the Sunny Health and Fitness Rowing Machine (SF-RW12045) is usually determined by the retailer you are purchasing the product from, nevertheless, Amazon provides free shipping and delivers to your doorstep in 3 to 5 days. The assembly of this rowing machine is pretty simple and easy and it comes with the major component preassembled. It does have an instruction manual that even walks you through the process of assembly without hassles. You can download the user manual right here if you want. The unit does not require any major maintenance except to always keep clean from dust and sweat. Make sure you wipe off sweat before storing it because sweat is corrosive and also dust it to always keep it in good condition. Are you an average user that is looking for an affordable rowing machine? Then this machine is ideal for you and can really help you to work yourself to a very good fitness level. The machine though it is compact and lightweight is very sturdy as long as the maximum weight capacity is not exceeded. It is simple and does not take up space and easily stored away. If you still wish to look at more options then feel free to look up our reviews on the best rowing machines, there you can still find favorable options. Feel free to ask any questions you may have and we shall be glad to respond accordingly.